Warning… Only Read if You Have Self Control – laps.lunges.leather. Seriously… only continue reading if you have self control. I clearly do not. Let me confess that I honestly believe that I am a sugar addict. I’m constantly craving something sweet. Can I blame my mother for this? She never let us have dessert unless we cleaned our plate… and she always served peas which I hate (well… unless they are in a pot pie and then I can eat them cause they are surrounded by gooey goodness). What can you conclude from this… I sometimes (um… often) missed dessert. I really try to eat a clean diet, and actually fare pretty well during the week. It is the weekend that I get way out of balance. If there is a cookie or a cake or anything remotely scrumptious I will gobble it down… and fast. For that exact reason, I don’t buy sweets for home frequently. 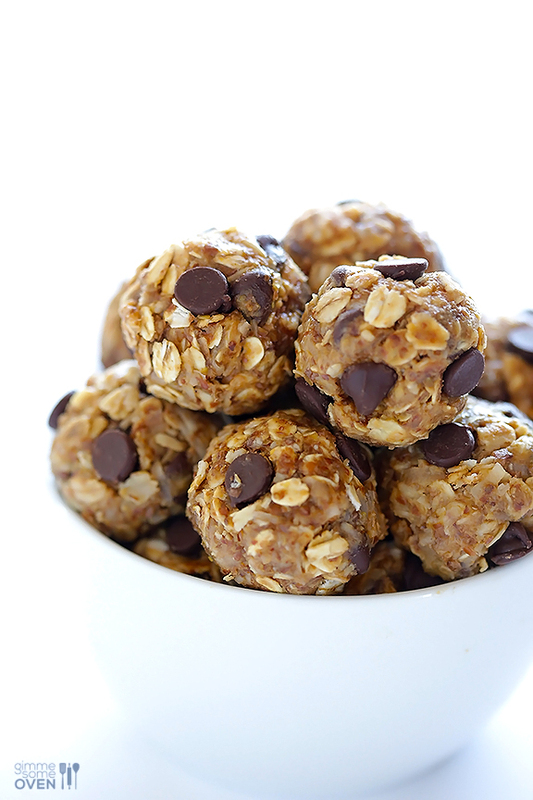 Last week, I was hungry for something sweet and I remembered the recipe for No Bake Energy Bites from the blog Give Me Some Oven. After a quick look through the cabinets and freezer, I was set to make these little balls of goodness. Stir all ingredients together in a medium bowl until mixed well. Cover and let chill in the refrigerator for half an hour. Once chilled, roll into balls of whatever size you would like. Store in an airtight container and keep refrigerated for up to 1 week. Recipe says it makes 20-25 balls, but I didn’t make it that far. Sounds easy enough, right? It really is until you discover that the balls are just so yummy that you have to have a few spoonfuls before they go to the fridge to chill. After putting them in the fridge to chill as directed, I attempted to make the balls… until I ate another few spoonfuls and said, “Forget the balls… I’ll do that later!” I put the container back in the fridge for the night. The next day, I had a few bites for breakfast and then proceeded to eat the rest as an after school snack. Those balls didn’t stand a chance. You may be wondering how many “Oh Wow(s)!” these earned from my husband. The answer is ZERO. This recipe was delicious, but sadly, Adam didn’t have a clue that I had even made them because I ate the entire recipe without his knowledge. What’s a girl to do… they were wonderful! Maybe it was guilt, maybe it was embarrassment, but I downloaded the book I Quit Sugar by Sarah Wilson. I need to get control of this situation, especially before marathon training begins again. This chic is going for a PR! Stay tuned… I plan to read the book and implement some of the suggestions, but September is my birthday month so it may be a slower transition.